We have adapted tic tac toe to play at Halloween or just for fall. Just take a large piece of poster board and draw the tic tac toe lines on it and then laminate if possible. Then cut out pumpkin and leaf shapes or ghosts and witch hat shapes and simply play tic tac toe. This is a great game for our preschool classes. Create the Spider’s Web. This is a Halloween game that works well when the parents visit for our Halloween party. The children sit in a large circle with one adult sitting next to each child. Take a large ball of yarn and have the child throw it across the circle to another child. [The parent holds onto the yarn before the ball is thrown.] Continue throwing the yarn back and forth until a large spider web is created. Place a large paper spider in the center and try to lift up the web without the spider falling off. The children love this game and the parent enjoyment being involved, too. Have children find places in the room and crouch down to look like pumpkins. The teacher begins by walking around the room saying: “Pumpkin Patch, pumpkin patch. Looking for a pumpkin in a pumpkin patch. Here’s one nice and fat, turn into a jack-o-lantern just like that!” She stops and taps the child closest to her on the word “that” Child then gets up and joins teacher by the hand and repeats the activity until all the children have been chosen. A fun, non-competitive game. Put a little sand in the bottom of ten large soda bottles to give them weight. Then cover the bottles with medium sized garbage bags, secure with tape. Let the children draw faces on the ghost bottles with black marker. Set up like ten-pin bowling but use a softball to bowl the ghosts down. kids of all ages love this game. Buy a skeleton already on a big sheet of paper or draw it. Tape a heart to it where a normal heart would be, then get red construction paper and help your kids cut out a little heart, put tape on the back of them. Blindfold them, and have them try to get the closest to the heart you put on! My kids have lots of fun with it! With a permanent marker draw a giant pumpkin on the orange tablecloth. Then draw and color in the eyes and the mouth. **Do Not draw in the nose** Then take the black construction paper and cut it into a bunch of triangle shapes “noses”. With the whiteout pen start on the first nose and write 1, then on the next write 2, and so on until you have one nose for each child. Then tape up your pumpkin, and one at a time blindfold the children and see who can get their nose the closest to where the real nose should be. 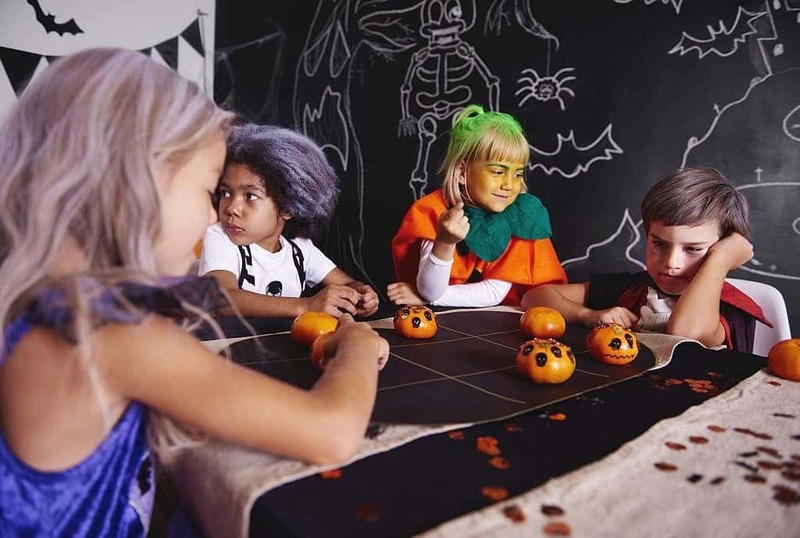 I teach a class of four-year-olds, and they LOVE these preschool Halloween games!